Kirsten from Barking Dog Shoes will be posting different bloggers in their red shoes for Valentine's Day. And if you are drooling over that Valentino flower handbag, above, check out the Roselyn Flower Satchel(an affordable version) from HANDBAG HEAVEN. On a side note, I was sad to hear that designer Alexander McQueen had committed suicide yesterday at the young age of 40. His were one the first designer garments I saw up close and personal when I was a stylist in NY. I loved his edgy and daring spirit. Like a breath of fresh air. Very sad. All you need is love and a red dress! Those red shoes are so cute! I love all that red stuff - my Grammy is always wearing red and it keeps my attention really well - thinking it's my favorite color. I really like your shoes. Red anything makes me happy. I love the red coats!! The red coat is divine! Also, so sad to hear about Alexander McQueen. I love the red heart purse! Too cool. Thanks for putting me in the Valentine mood! Just got to say I love those shoes! I heart all things read. Especially those shoes of yours!! great display of red!! Have a wonderful weekend. That first red velvet jacket (even though it says marie claire) looks exactly like my white house blk market red velvet jacket. Oh how I wish I had some red shoes! I was wearing my red coat today though! Love all of the handbags you show! Very pretty! I just discovered the wonder that is red handbags. I'm addicted I have to admit. Love the shoes...where I can some? I love all things red and beautiful. I am loving everything from your shoes to the dress. Alexander McQueen was very talented. Very sad. Love the ruffly red coat on the top right. 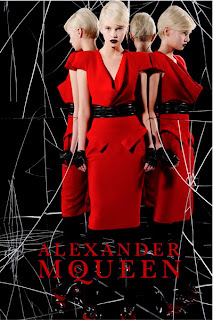 So sad about Alexander McQueen. Ooh, love red and LOVE that bag. I'm definitely going to check out the affordable version. Have a fabulous Valentine's Day! When I was a little girl, I had a thing for red shoes ... they were the only color I would wear! I continued that when I was an adult ... even when it didn't always look that good! I had this awesome pair of red hiking boots that I adored but I realize (in retrospect) probably looked a little goofy. And that is sad about Alexander McQueen. I always feel so sorry when I hear people choose to end their own lives. Tragic. What a cute idea. Love your shoes. I will go and check it out. oooooooh, I love read! and I totally WANT that flower red purse, I went to go buy it, and it's $1,600, haha. I have a rule, never buy a purse for more than $100 :) I usually only use one purse for about 6 months, so it wouldn't be worth it for me. Crystal--yep, me too. That's why I put that knock-off link below it. You should check it out! Oh girlie I'm loving your shoes!!! Ok loving all those purses the little clutch with the bow for the clip is my fav!!! Oh no I hadn't heard about Alexander McQueen. What a sad tragic story. i have a red patent handbag i love. i have some red patent heels too but the occasion I get to wear them is few and far between. All those red bags just look so gorgeous together!